You can use CIFS (SMB) shares as backup repositories. An SMB share cannot host Veeam Data Movers. For this reason, to communicate with the SMB share, you need to deploy a gateway server. 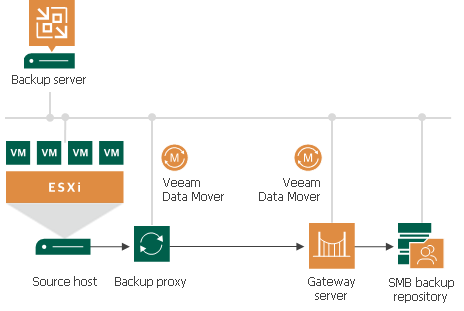 Veeam Backup & Replication will automatically deploy a Veeam Data Mover on this gateway server. For more information, see Gateway Server. When any job addresses the backup repository, the Data Mover Service on the gateway server establishes a connection with the Data Mover Service on the backup proxy, enabling efficient data transfer over LAN or WAN. If you plan to move VM data to an offsite SMB repository over a WAN link, it is recommended that you deploy an additional gateway server in the remote site, closer to the SMB repository.